Anjun Zhou has over 16 years of investment experience. She is currently responsible for leading the Multi-Asset Research Group at Mellon Capital for the design and development of investment strategies and solutions across asset classes. 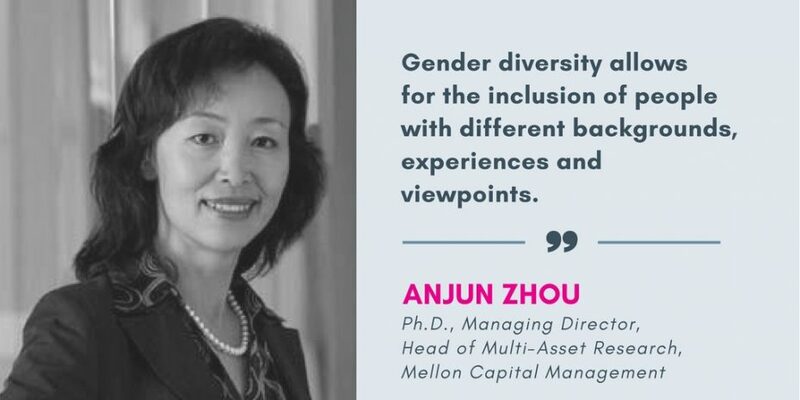 Prior to Mellon Capital, Anjun was Executive Director at Morgan Stanley, responsible for portfolio management and product development for its asset allocation clients. Prior to Morgan Stanley, she was Vice President at Deutsche Asset Management and Principal at State Street Global Advisors. Anjun has authored publications on real asset investing, volatility modeling and innovative approach to stock selection. 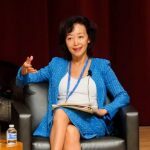 Anjun is quoted for her asset allocation expertise in professional publications and on media. Anjun earned her Ph.D. in Finance from the University of Illinois at Urbana-Champaign, and a B.A. in Business Administration from Peking University. I was born in communist China, in an era with food shortage and political chaos. Despite all the sufferings Chairman Mao Zedong was responsible for, one thing he did was highly appreciated by many and with a far-reaching impact. Mao encouraged women, who for centuries had been in a subordinate position with few choices, to walk out of their kitchens and households and work alongside their male citizens. The essence was summed up in one of his famous quotes – “Women hold up half of the sky!” As a result, from my mother’s generation on, women and men were treated more or less equally, although sometimes too literally. For example, some women braved heavy weights on construction sites, only to end up with back injuries! Yes, I grew up with rationed food and very limited nutrition, especially during those harsh winters. But I never felt any disadvantage (or privilege for that matter) as a girl and a young citizen. Boys and girls studied in same schools and classrooms, and teachers would not point to different career paths because of their gender differences. In the eyes of girls like me, the sky was the limit! Years later I came to the US to pursue advanced education. In school, I was encouraged to strive for academic excellence and to plan a successful career as everyone else. By the time I entered the financial industry, I worked alongside men and women, equally talented, to contribute to business growth. Later I moved to New York and started to work for Deutsche Bank. That’s when I became part of the Women on Wall Street network. Through the life stories of successful professional women, I learned behavioral differences between women and men, why women did not advance as much as men, and what we could do to change it. This learning experience was immensely enlightening! It certainly made me realize some of my own limitations and weaknesses. It became clear that to further advance my career, it was no longer sufficient to simply put my head down and do a good job. There is a vast world beyond my office space that I should pay attention to. As I got to know more women in my industry and beyond, I started to hear more about that glass ceiling. Granted, a lot of progress has been made over the years, and many companies include diversity as an integral part of their mission. Gender diversity, and diversity in general, allows for the inclusion of people with different backgrounds, experiences and viewpoints. This, in turn, helps to promote creativity and drive innovation – a key element, in the eyes of its advocates, to business success. For companies like Mellon Capital, facts speak louder than words. With all the candidates we have interviewed over the years, I do not remember ever having to talk about the importance of diversity. Most candidates quickly picked it up and some commented how comforting it was for them. In her influential book “Lean In”, Sheryl Sandberg quotes studies on how such a glass ceiling discourages women, often from the early stage of their career, to think less of themselves and stop short of their potential. What a stark contrast to that fearless girl from China who knew of no bound? For those women who lack confidence, feel belittled, or contemplate quitting their jobs because they are “not good enough,” always remember — women hold up half of the sky!